After a week of spending my sewing time doing the hand stitching on a quilt binding, I went back to my Farm Girl Vintage blocks on Saturday. The author, Lori Holt, keeps creating new blocks to supplement what is in the book. This corn and tomatoes block is the latest supplement. The corn requires 30 different yellows and the tomatoes use 24 different reds. It took a very long time to cut all the little pieces for this block as there’s 94 pieces in it. I complicated the cutting as I cut for the 6 inch block for my quilt (pictured above) and also cut fabric for a 12 inch block to make into a small summer wall hanging for my kitchen. My original intent was to make the larger block into a pot holder, but there’s no way I’m going to get grease all over a 94 piece block, so wall hanging it is. Once cut, the block sews together rather easily, not quickly, but easily. 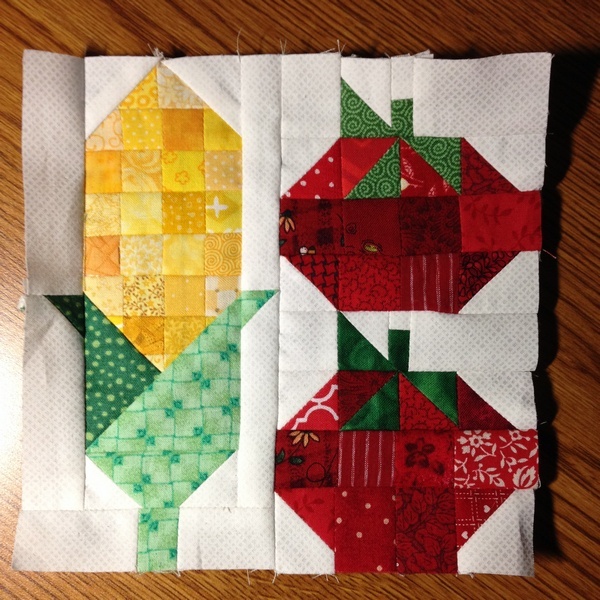 The middle red square on the right in each tomato looks big, but once it’s sewn to another block, the seam allowance will be used and the block will be proportionate. The second picture is my dinner from Saturday night. Wes and I went out with our Fine Dining Club to the Red Brick Inn in Rosendale. 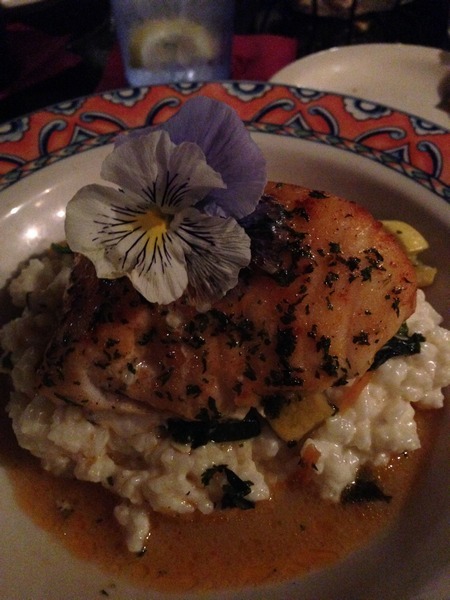 I ordered sea bass with spinach over risotto and I was so impressed with the presentation, but not so much with the taste. Unfortunately, you can’t eat pretty. However, dessert, which was warm peach cobbler was delicious. Love the block! I think all the colors of yellow and red really make the block!